Abstract: Huntington’s disease (HD) is arguably one of the most disabling adult acquired neurogenic conditions. The disease results in an array of symptoms which leave the individual increasingly reliant on their carer(s). The people on whom the PWHD most frequently relies are more likely to be family members than medical professionals, and it is widely held that family members who care for loved ones with a disease or illness often experience poor quality of life as a direct result of caregiving. 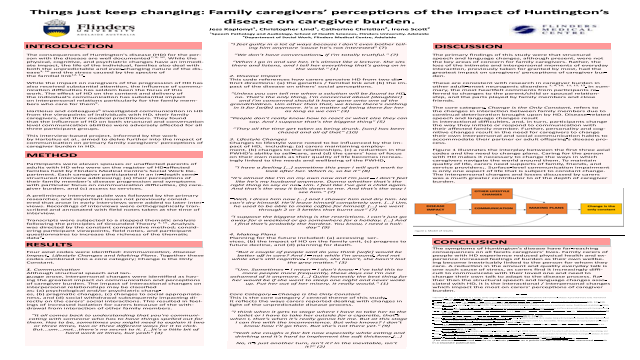 The current research aims to answer the question; how does HD impact on primary family caregivers’ perceptions of caregiver burden? Participants in this study were spouses or unaffected parents of people with HD who were supported by Flinders Medical Centre’s Social Work Department. Eleven primary family caregivers participated in semi-structured interviews which focused on the factors that influenced their perceived caregiver burden. Transcripts of interviews were analysed according to the principles of Grounded Theory. Four key themes were identified; 1) disease Impact, 2) communication, 3) making plans, and 4) lifestyle changes. Results suggest that although service delivery, disease progression and speech, language and communication changes impact greatly on perceptions of caregiver burden, psychological and psychiatric changes (e.g. personality change) brought upon by HD are the greatest source of caregiver burden. Results also identified that caregivers face a life of continuously adapting to change imposed by the HD until the death of their loved one.Summary: Primary family caregivers (spouse or unaffected family member) perceptions of caregiver burden in caring for someone with Huntington's disease.References: Abendroth, M., Lutz, B. J., & Young, M. E. (2012). Family caregivers’ decision process to institutionalize persons with Parkinson's disease: A grounded theory study. International Journal of Nursing Studies, 49(4), 445-454. Dawson, S., L. J. Kristjanson, C. M. Toye and P. Flett (2004). "Living with Huntington's disease: Need for supportive care." Nursing & Health Sciences 6(2): 123-130. Glaser, B. G., & Strauss, A. L., (1967). The discovery of grounded theory: Strategies for qualitative research. Grawburg, M., Howe, T., Worrall, L., & Scarinci, N. (2013). Third-party disability in family members of people with aphasia: a systematic review. Disability and rehabilitation, 35(16), 1324-1341.